What is Camphor Oil ? Camphor essential oil is steam distilled from the wood of the tree. It has a sharp, pungent camphoraceous scent and is clear in color. The aroma of camphor is familiar because it is used in everyday household products and laundry soaps. It should be used in small amounts, as it is very strong. Camphor essential oil is known to help relieve pain in muscles and arthritic pain with its analgesic action, as well as being stimulating to the circulatory system. It has a duality of hot and cold actions, cooling at first touch, then stimulating heat and circulation. It is also antiviral and antibacterial, so is used for congestion and colds. Camphor oil can be blended with lavender or cajeput in antibacterial blends. It is blended well with eucalyptus, rosemary, lavender, and the spice and citrus oils. Blend with lavender and tea tree to help dry oily skin and acne. Be careful to use in small amounts as it can irritate skin. Avoid while pregnant. 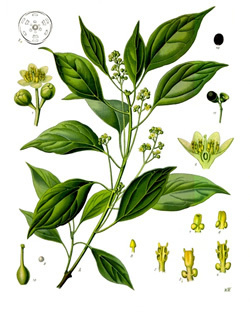 Botanical Information - Rituals & History : The camphor laurel is a large evergreen tree that produces small white flowers and red berries. A lump of camphor was traditionally worn around the neck as a protection against infectious disease.